Ian Crowley is accused of attacking his mother with a meat tenderizer. A Massachusetts man accused of assaulting his mother with a meat tenderizer on Wednesday night has been captured in Vermont. Walpole police said Ian Crowley was taken into custody without incident in Hartford, Vermont, on Friday. No other details were immediately available. "Thanks to the agencies that assisted in the search and to the media outlets and general public who shared tips to assist us," Walpole police tweeted. The attack occurred around 7 p.m. Wednesday on Common Street following an argument between Crowley and his mother about alcohol consumption, Walpole police said. Crowley's mother suffered wounds to her back and head and was taken to an area hospital. Police had warned neighbors to keep their doors locked as they continued their search for the suspect. Police and K-9 units canvassed the town Thursday in search of the suspect, whom police said is known to have mental health issues. Neighbors said they were shaken up by the incident. "We never have anything like this happen here. It's usually pretty quiet," neighbor Paul Alagha said. "They just told us they are looking for someone in a black track suit." Crowley allegedly fled the area on foot wearing a dark Fila jumpsuit. Since no weapon was recovered at the scene, the suspect was believed to be armed. There was no immediate word as to whether Crowley had a weapon when he was apprehended Friday. Police said Crowley is no stranger to the outdoors. 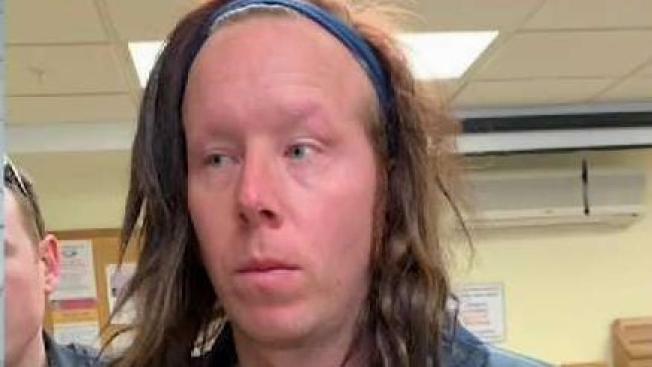 "Ironically he just came back from traveling around other parts of the country and from what we understand he stays outside a lot, either outside or in tents and that kind of thing," Walpole Police Chief John Carmichael said this week.